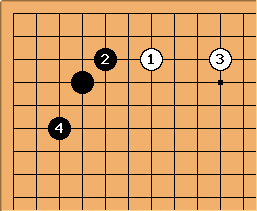 The distant low approach of against a stone on the 4-4 point is not a very usual approach move. In most cases White would prefer a normal low approach. 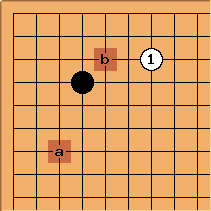 Black usually plays a or b. The distant low approach usually appears after a wedge such as . Now is a natural extension from but going a space further is possible. is a calm answer to the low approach aiming to take a good portion of the corner and expand to the left side. 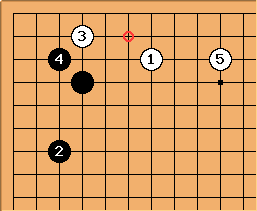 White typically slides into the corner with an ogeima of her own and then makes a solid base with . In case there already is a white stone at , White can tenuki. It should be noted that White's slide is rather thin and Black has a good follow up at the circled point. See 4-4 point ogeima slide follow up. Black's kosumi of very clearly aims to take the corner territory. White will usually extend along the upper side at or around . Black then secures the corner with . 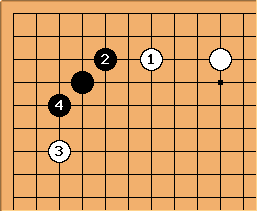 If White allready has a stone on the top side and does not feel the need to defend after , she can play at or one space higher aiming to slide into the corner. If Black plays the corner is completely secure (see three crows) but White did get to develop on both sides. 50 variations can be found in Chapter 4 of Sanzi Pu by Guo Bailing. It has been translated into English under the title Three-Stone Games. 54 variations can be found in Chapter 5 of Sizi Pu by Guo Bailing. It has been translated into English under the title Four-Stone Games.